Finally i can talk about Sansar. My work as a artist have found new ways in the digital era and to my surprise older artworks and paintings have gone full cycle and show up at quality auctions making them a foundation for new work and a inspiration for me that people still like my work. My work is mostly experimental. I always want to know what happens if you put this thing on this one. Will there be some great art then? I have worked forever trying to find what art is all about and new media and computers are one of my greatest friends. Hacking art and soceity to find the basic code behind it all. I use my knowledge of building hardware and writing software to do experiments in digital art and research our lifes and death. The creation process is the same if you paint or use digital media. My work spans a lot of areas. Sometimes maybe they are to many. After art school i started out as a painter but i quickly got in to computers and the Internet. I still like to work with digital media. 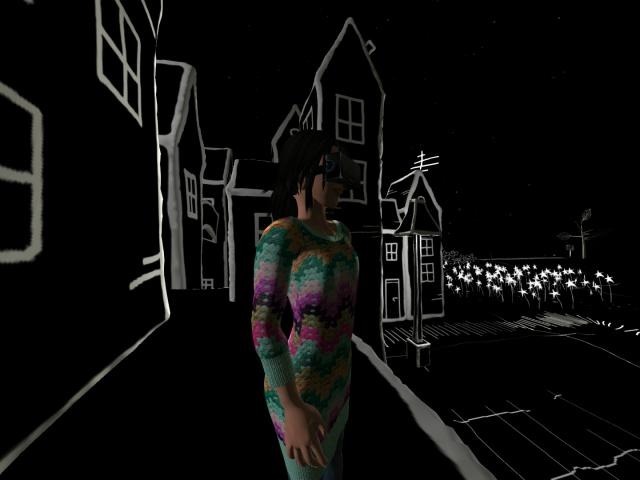 Exploring virtual worlds and create art for the web and games. Today i got the Oculus rift that makes it possible to bee in a alternate reality. I think art willl never be the same. I do a lot of graphic design for digital media in gaming and virtual worlds. And i love the digital camera. I do not have to work in a smelly darkroom anymore if i do not want to. I do many purely digital pictures in software and as a photographer at the hypergrid. And i also have a gallery there where i can show of my work. It is all net, servers and streaming information. Anna Lorentzson. Now in Second life. Anna Lorentzson is now at the Nilsart gallery The exibition that was at the Opensimfest have now moved over to SL. It is a bug. Hypergrid travelleling reporter and photographer for art space Magazine. VATSIM pilot and IVAO Tower controller. Building my own simulator. Tricia Aferdita Collection showing in Avalon town hall. Back in the new place in Avalon town. The new place in Tabula rasa is here. Another repaint for Sky Aurora. I did drive trucks once. Cica Ghost do it again. Virtual art finding its own way. Driving ETS2 thru the suburbs. LEA just so much to see. How would i ever find new artists? Some problems with the website. Looking out the window. hmmm. Finally the new place takes shape in Avalon town. Flying controlled airspace by accident. Final setup. Many flights no software crashes. Landed at ESSB after a not so good landing. Pheeww I made my first controlled flight. 3 good landings in a row. Now I am flying for a virtual airline. First flight on IVAO and Oculus rift test. You should see what I see. This is something to explore. Today I did some truck driving. Finally got the IVAO tower beta out for some testing. Waiting at ENGM for company flight to land. Nice to do repaint for Sky Aurora. Starting work on some AI related stuff. Not been around for a while. I am @ Opensim fest. I am the fest and then the exhibition moves to Second life . More to come. Another good one from Cica Ghost. Drawn Town by Cica Ghost. I always like to visit the mind of Cica and her strange but very obvious and talented VR art creations. Worked well in the Oculus to. Good framerate. When i am inworld i use my Oculus rift so if i do not answer the chat it is because i cant see my keyboard. Try voice. Scripting planes in Second life. Started work on Opensim Lendonia again. Web templates on its way. The quality of things in Second life. Sorry about the mess with logins. Finally the simulator is up again. The new High Fidelity Sandbox. Maybe a new career as a VR DJ. Another transport for 2worlds2go logistics. Back in a old game. Todays company flight to Bergen. Beta testing MyWorld on Steam. Finally found my name while driving. Long day just taking a break. ROMANVM that’s a great build. Starting to work on AI for Opensim. Back in to Sansar. Today Bryn Oh. Playing Adrift for a few hours. Once more partying in Second life. The thing we all have been looking for is finally out there. Linden labs Sansar. I have been checking it out for a while but now i can write about it and that is nice. And so is Sansar. Nice.I have a Oculus so i can check out the experiances all the way. And i still say Sansar is nice. The graphics good. The update is good. Will be great if you want to do a simple game. And i suppose people will create new tools you can use to make buildning easy. As a user of AltspaceVR, sinespace, High Fidelity and now Sansar i just ask my self "will anybody ever use these products?" It have a distinct feel of Blue Mars. You wait for the download and then come into a small space that look great and wonder why am i here? Is there any reason at all? There will be some cool games i guess. But if i want to play a really cool game i have Steam. At the moment i think it is a question about wait and see. You are here: Home Cyberserenityś blog Finally i can talk about Sansar. Copyright © 2019 2worlds2go. All Rights Reserved. Joomla template created with Artisteer by Cyberserenity (aka Anna Lorentzson.